Ariana Grande moved further up the stardom ladder with the release of her last album Dangerous Woman back in 2016. The pop starlet should be enjoying her time on top of the world but instead the last couple of years have been full of life-changing events for her. During her Dangerous Woman World Tour, a terrorist attack took place in May 2017 at the end of her show, killing 23 fans. Understandably taking an immediate break, Grande put on a brave face to organise and front charity concert One Love Manchester, and she struggled to hold it together during her performance. Since that event, Grande experienced a break-up with her long-time partner Mac Miller, who tragically died from a drug overdose earlier this year, and she got engaged to and broke up with Saturday Night Live star Pete Davidson. Grande’s latest album Sweetener was recorded somewhere in the midst of all that and you’d be forgiven for expecting a downbeat album reflecting on what she’s been through. Interestingly that’s not what Grande delivers, instead opting to channel hope and optimism as she moves through one of the most difficult times in her life. In the promotion for the record, she broke down in tears during a Beats 1 interview, while explaining how she gets through from one day to the next dealing with all that’s taken place. Sweetener’s lead single is the deceptively titled No Tears Left to Cry, which is far from the exhausted ballad it sounds like it’s going to be. The track is an uptempo electro-dance moment that finds Grande in a defiant place, ready to overcome her troubles and get her life back on track. The second track that arrived from the record was The Light is Coming featuring frequent collaborator Nicki Minaj. Again, it caught fans off guard with its stark electro rhythms as Grande declares, ‘the light is coming to give back everything the darkness stole’. It’s a message of hope to her fans as well as a personal mantra for Grande herself. With this album, Grande is building on the sounds she’s explored before and pushing her music forward. Opening with an acapella snippet based around A Four Seasons song, Grande’s voice grabs your attention and reminds you why she’s become one of the biggest pop stars in the world. The beats kick in on the next track, Blazed, which is one of seven tracks written or co-written, and produced by Pharrell Williams. It’s a throwback disco number with plenty of shimmer and Grande’s angelic voice layered throughout. Perhaps one of the boldest tracks on the album is God is a Woman. It’s a very sultry affair that’s more sexual than anything Grande has released before. The song also embraces feminism and feels particularly poignant given the #MeToo movement that is still creating waves across the world. It’s one of Grande’s best songs in ages and it stands out on Sweetener. The tracks that really shine here are the Pharrell Williams produced ones, which should come as no surprise. 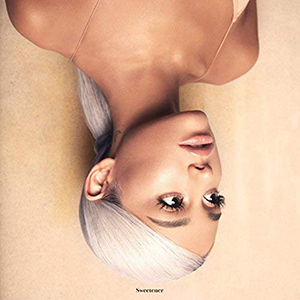 The dull beats of Successful give way to humble brags as Grande celebrates her achievements, the title track finds the singer trying to see the bright side through difficult times, and the electro-R&B of Borderline features a guest rap from Missy Elliott. The album’s closing track, Get Well Soon, is lyrically deeper than you’d expect from the instrumentation with Grande exploring the anxiety she experienced following the Manchester events. For the most part Grande is pushing boundaries on Sweetener. There are a handful of tracks that blur into each other, and I’m sure she’s wishing she hadn’t including a short ode to her short-lived fiancé Pete Davidson. Other than that, it’s a confident pop record that will keep her on the charts and in the hearts of her vast fanbase. Personally I’d like to really hear what she can do with that huge voice she possesses and I suspect that’ll come in time. Until then, this is an enjoyable and uplifting record.